We accept all major credit cards including Visa, Master, Switch, Solo, Delta. 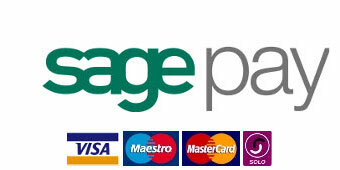 SagePay is a fast, secure and convenient way to shop online. Sage Pay is the UK’s largest independently owned processor of secure, real-time, online credit and debit card transactions. They are assessed yearly for Payment Card Industry (PCI) compliance by a Visa Qualified Security Assessor. Checkout is a free service for buyers. We use a SagePay to process your order. Once you have given us your card details, we immediately pass them on over another secure connection. We do not keep a record of your card details, so even if our server is `hacked’ or even stolen, your card details will be safe.